In general terms, the Romans coined the name 'Gaul' to describe the Celtic tribes of what is now central, northern and eastern France. The Gauls were divided from the Belgae to the north by the Marne and the Seine, and from the Aquitani to the south by the River Garonne. They also extended eastwards, into the region that was becoming known as Germania. The Celts had ruled much of this in their heyday, but by the middle of the first century BC they were fragmented, and were either in the process of being expelled by the increasingly powerful Germanic tribes who were migrating southwards from Scandinavia and the Baltic coast, or they were being defeated and integrated into Germanic or other tribes. The Marcomanni were one such Germanic tribe, and by the first century BC they were located in central western Germany, between the massive homeland of the Boii to the east and the Rhine to the west. They were neighboured by the Hermunduri, Quadi, and Tulingi. The Marcomanni name (using its Roman spelling), or Markmen in modern English, was formed from the word for 'borderers'. This was a name that is very similar is that of the Belgic Ambiani tribe. The word was formed from the proto-Celtic *ambi-, which is a preposition for 'around'. In Latin this is 'ambitus', meaning border, edge, extent or going around, circuit. So the Ambiani would probably be the 'people of the border'. Marcomanni meant much the same thing - the 'bordermen'. They were probably a group that had only recently been formed, perhaps from the division of a larger body of Germanic people. 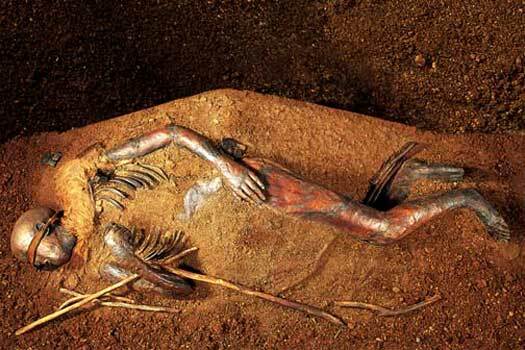 The Marcomanni are best known for their destruction of the Boiohæmum, the land of the Celtic Boii. However, it seems very likely that this was instead a Marcomanni takeover, one realised by a Germanic military elite moving in to become the new nobility, and ruling over an unchanged population. The same thing seems to have happened when the Slavic Czechs migrated into the region several centuries later. There exist Czechs today who have an appearance that is not typically Slavic and not particularly Nordic (Germanic), which is what would be expected if the population was entirely Slavic or Germanic respectively. The most important pointer for this supposition is that the Marcomanni leader, Maroboduus or Marbod, has a Gaulish name. There were several instances of Celtic tribes being led by Germanic rulers, or vice versa, and in this case it would seem that a powerful fighting force of Germans calling themselves the 'Bordermen' ('Marcomen'), led by a Gaul, took over the Boii. The 'Borderman' name itself is a potential give-away, as it was probably the Boii border to which they were referring. Following their successful takeover, the Boii simply changed their name and language under the new administration. Controversy exists as to whether particular tribes were German or Gaulish (Celtic), and the Marcomanni are one of those tribes which may straddle both definitions. The subject is discussed in greater detail in the accompanying feature (see link, right). Overall, the Suevi group to which the Marcomanni were ascribed were a confederation of Germanic peoples which included the tribes of the Alemanni, Hermunduri, Langobards, Quadi, Semnones, and the Warini, along with the Suebi themselves. Some elements of the Marcomanni formed part of the Bavarii confederation at the start of the sixth century. The term 'Suevi' seems to have been used almost casually to describe a wide range of German peoples. The Heruli may also have been involved and the Angles in the Cimbric Peninsula certainly were. Ariovistus is a leader of the Suevi and other allied Germanic peoples in the second quarter of the first century BC, and at least up to 58 BC. Displaying the interconnected nature of Germanics and Celts at this time, he is a fluent speaker of Gaulish, and one of his two wives is the daughter of Vocion of the Norican kingdom. The Marcomanni also appear to exhibit cross-cultural links of this nature, albeit half a century later, although the events of 58 BC show that they already exist as a separate entity. This can probably be taken as confirmation that they already border the Boii in central western Germany. Nero Claudius Drusus Germanicus, stepson of Emperor Augustus, is appointed governor of the Rhine region of Gaul. He launches the first major Roman campaigns across the Rhine and begins the conquest of Germania. He starts with a successful campaign that subjugates the Sicambri. Later in the same year he leads a naval expedition along the North Sea coast, conquering the Batavi and the Frisii, and defeating the Chauci near the mouth of the Weser. In 11 BC, he conquers the Bructeri, Usipetes and Marsi, extending Roman control into the Upper Weser. In 10 BC, he launches a campaign against the Chatti and the resurgent Sicambri, subjugating both. The following year he conquers the Mattiaci, while also defeating the Marcomanni and Cherusci, the latter being taken care of near the Elbe. Drusus is killed in a fall from his horse during his fourth campaign, and his death deprives Rome of one its best generals. However, it also ends the campaign against the Germanic tribes, and may even be responsible for creating the circumstances in which one Maroboduus becomes king of the Marcomanni. King of the Suevi Marcomanni. Died AD 37. Perhaps forced to move by the Roman campaigns of 12-9 BC, migrations of Marcomanni and Quadi from the region of northern Bavaria and the River Main lead them eastwards into the homeland of the Boii (in later Bohemia), where that Celtic tribe is subjugated by the newcomers. Marbod forms a confederation of tribes which includes Langobards, Lugii, Marcomanni, Quadi, and Semnones. Possibly this incorporates remnants of the alliances of Ariovistus of the Suevi in 58 BC. Following their successful takeover by the Marcomanni, the Boii simply change their name and language under the new administration. Roman Emperor Tiberius undertakes campaigns against various Germanic tribes in an effort to extend the frontiers of the empire from the Rhine to the Elbe. The Langobards take part in attacks led by the Marcomanni but their power is broken by the legions of Tiberius. For the Marcomanni, the outcome is slightly different. The expedition of Tiberius is the high-water mark of Roman invasion onto Teutonic soil. When a Roman fleet that is sailing up the Elbe establishes communications with a Roman army upon the river's bank, it might well be thought that the designs of Augustus are about to be accomplished, and that the boundary of the empire is to be traced by connecting the Danube to the Elbe. The Marcomanni have to be attacked because they lay across this would-be link. However, an insurrection breaks out in Illyricum and the presence of the Roman army is required. A hasty peace is concluded with Maroboduus, leaving him in firm possession once again of the Boiohæmum. War breaks out between Arminius of the Cherusci and Maroboduus. The cause is Maroboduus' decision not to join the Cherusci-Roman war of AD 9 in common cause with his fellow Germans, although the two are clearly also rivals for superiority amongst the tribes. Now the Cherusci join with some of Maroboduus' own Suevi subjects, the Langobards and the Semnones, to stage a revolt against his power. Following an indecisive battle, Maroboduus withdraws by AD 18 into the territory that later forms the core of Bohemia. In the following year, a nobleman named Catualda, who had been exiled by Maroboduus (with help from Vibil of the Hermunduri), now returns (it has been suggested that this could be a Roman plot to sow discord). Maroboduus is defeated by him and is deposed. Forced to flee, he travels to Italy and is imprisoned by Tiberius in Ravenna for eighteen years before his death in AD 37. Catualda gains the leadership of the Quadi, and while it is not known who commands the Marcomanni now, this may also be Catualda. Former Marcomanni exile. Also ruled the Quadi. Catualda of the Marcomanni bears a Gaulish name, with the first part, 'katu' or 'catu' meaning 'battle', and the second part being rather obscure, but possibly being a mangled-by-Romans 'wallo' plus something with a 'd' in it (-ualda, the terminal 'u' and initial 'w' would have merged), making it most likely (by Occam's Razor) that it is an equivalent to the seventh century AD British name of Cadwallader (in Welsh, Cadwaladr). Vannius of the Quadi shows an inclination to rebuild the Marcomanni confederation, so Rome instigates an insurrection to solve what it sees as a problem on its borders. The regnum Vannianum of the Quadi breaks up following the insurrection which is led by the nephews of Vannius, Wangio and Sido, supported by the Hermunduri. Vannius is deposed and later dies in unknown circumstances. Wangio gains the leadership of the Quadi while Sido gains that of the Hermunduri. Who now rules the Marcomanni is entirely unknown. Towards the end of the century, Rome establishes two provinces on the border territory between Gaul and Germania, calling them Germania Superior and Germania Inferior. Cities such as Aachen, Cologne, Mainz, Speyer, Trier, and Worms are all founded within these provinces by Rome and all of them become important medieval cities. Writing around this time, Tacitus mentions the Suevi, listing their constituent tribes which cover the larger part of Germania. Clearly in the century and-a-half since they were led by Ariovistus they have expanded considerably. Noted for their custom of twisting their hair and binding it up in a knot, the Marcomanni are still counted as part of the Suebic confederation. King during the Marcomannic Wars. 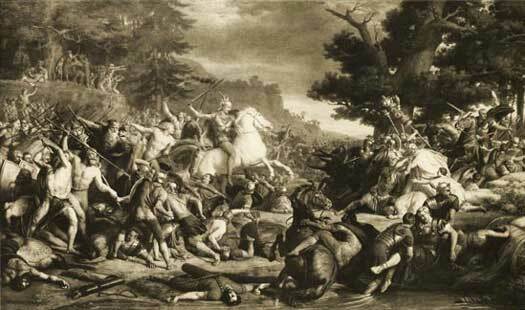 According to Cassius Dio, just before the Marcomannic Wars that begin in AD 166, a host of 6,000 Langobards and Ubii cross the Danube and invade Pannonia. The two tribes are defeated by Rome and halt their attacks. 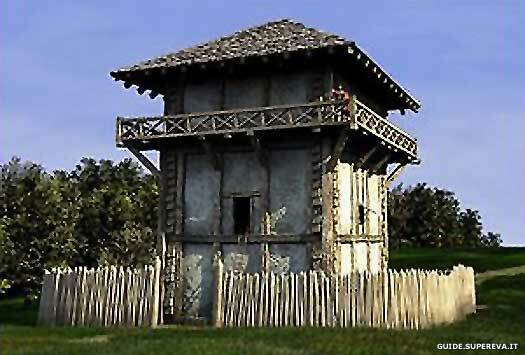 They send Ballomar as their ambassador to Aelius Bassus, the governor of Pannonia. The two agree peace terms and the Langobards and Ubii are allowed to cross back over the Danube. The Langobards return to their territory on the lower Elbe. Perhaps it is this wandering that finishes off the minor Calucones tribe in that region, with them either being absorbed by the Langobards or perhaps the Marcomanni. A new Marcomanni confederation is formed which also includes elements from many other tribes including the Buri, Iazyges, Quadi, Sarmatians, and Suebi. Under the leadership of Ballomar, they cross the Danube and invade Dacia. They penetrate as far as Italy, forcing the Roman emperor, Marcus Aurelius, to spend the rest of his life campaigning in the Danube region to contain the problem, which he does (to an extent) with a further defeat of them in 180. At the end of a renewed campaign by Marcus Aurelius against the Marcomanni, the emperor has 40,000 Romans posted on Marcomannic and Quadian territory in various garrisons and has the Cotini and Osi resettled from Slovakia to southern Pannonia. The newly freed territories are mainly settled by the Quadi, although this expansion often brings them into conflict with Rome in the third century, and the assassination of their ruler in 215 is ordered by Rome. Marcus Aurelius dies while conducting what would have been a final Roman campaign against the most dangerous barbarian Germanic tribes across the Danube. It is formed of an alliance which is under Marcomanni leadership and includes Dacians, Peucini, and Sarmatians. As it is, the problem is never fully resolved. Following the death of Roman Emperor Marcus Aurelius and further Germanic unrest, the Buri petition Emperor Commodus for peace. At this point they are destitute, having spent their resources on war. Fortunately, they now meet the empire's qualifications for financial aid, in that they are destitute and potentially dangerous, so they receive the help they need. The Marcomanni are enjoined from seeking retaliation. As they are also now destitute and seeking terms, they comply. In 254, the Marcomanni, presumably with various allies, invade Pannonia. By 258, Roman Emperor Gallienus concludes an alliance with the Marcomanni king, Attalus (mentioned by the fourth century historian, Sextus Aurelius Victor). This is probably part of a process to outsource the defence of the empire's northern borders to foreign agents, but it also allows Marcomanni settlement in Pannonia, probably also as border guards. The Romans assassinate the ruler of the Quadi, which angers not only the Quadi themselves, but also the Marcomanni and Sarmatians. They invade Pannonia, albeit briefly (with the Marcomanni presumably helping the others across the border that they are supposed to be defending). The following year, Emperor Valentinian I punishes the Quadi by staging a retaliatory invasion of their territory. The brief war ends with peace terms being agreed, and the event marks the last time the Romans enter Slovakia. The Suevi confederation is disrupted by the Hunnic invasions. The same invasion forces many Germanic tribes to move or submit to the powerful newcomers, but the Marcomanni effectively vanish in the sudden shifting of populations that takes place. Survivors may find refuge amongst the Alemanni, Rugii, Suebi, and Vandali. However, they may retain a separate identity, perhaps as a sub-tribe. There is a mention of a 'Queen Fritigil of the Marcomanni around this time. Unnamed king of the Marcomanni. It is around this time that a 'Queen Fritigil' is mentioned (by Paulinus) in connection with the Marcomanni, suggesting that they have retained their identity despite apparent destruction during the Hunnic invasions. Queen Fritigil accepts conversion to Christianity from St Ambrose, bishop of Milan, who also corresponded with her on church matters. Following her conversion, her husband and his subjects follow. The wording suggests that the queen is not the ruler of the Marcomanni - instead that duty falls to her unnamed husband. The bulk of the Suevi cross the Rhine at Mainz in 406 in association with the Vandali and Alani. After spending two years on the west bank of the Rhine, all three tribes settle in Roman Spain by 409. The Suevi kingdom is formed in the north-western region of Galicia. Some Suevi groups remain on the Rhine as part of the Frankish confederation while others remain further east and north, such as the Langobards, Lugii, and Warini and, in the southern Cimbric Peninsula, along with the Angles and Eudoses, the Swæfe, who are ruled by the Angle, Witta of Wehta's Folk. The Suevi's closely-related associates, the Alemanni, also remain behind, on the east bank of the Rhine, but the Marcomanni appear to have left all of them behind, seemingly remaining in Bohemia. 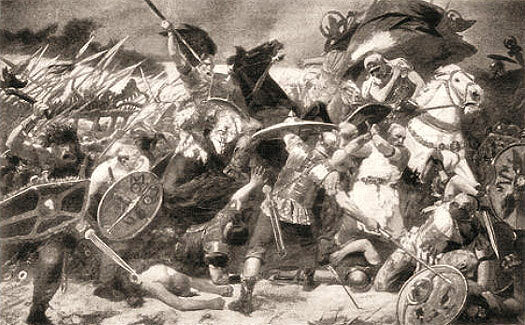 In their fight for independence from the Huns, the Ostrogoths defeat and rout Attila's sons. They inherit control of Pannonia as a result, and absorb elements from other, smaller tribes, such as the Scirii. The Rugii avoid this fate by settling Bohemia and Lower Austria, to the north-west, areas that may still serve as home to the Marcomanni or which may border them. Elements of the Marcomanni form part of the Bavarii confederation, which is first documented at the start of the sixth century in Bohemia and Bavaria. The history of the tribe is now tied to that of the Bavarii who continue to survive and flourish in south-eastern Germany.